1. 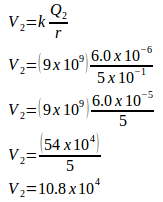 Determine the electric potential at a point located at 1 cm from a charge 5.0 μC. Coulomb constant (k) = 9 x 109 Nm2C−2, 1 μC = 10−6 C.
2. Charge Q1 = 5.0 μC and charge Q2 = 6.0 μC. 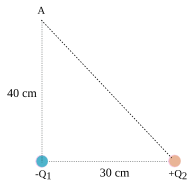 Coulomb’s constant (k) = 9 x 109 Nm2C−2, 1 μC = 10−6 C. Point A located between the charges. 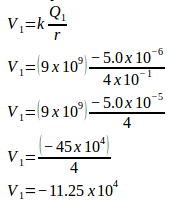 Determine electric potential at point A. 3. Charge q1 = 5.0 μC and charge q2 = 6.0 μC. 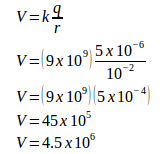 Coulomb’s constant (k) = 9 x 109 Nm2C−2, 1 μC = 10−6 C. Determine the electric potential at point A.